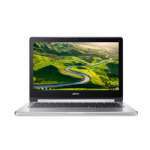 The Acer CB5-312T-K1W1 Touchscreen 13.3" Chromebook features IPS Active Matrix TFT multi-touch display with a 16:9 aspect ratio, 1920x1080 resolution, and LED backlighting, all of which are powered by integrated PowerVR GX6250 graphics. The system is powered by a 2.1 GHz MediaTek M8173C Quad-Core processor. It features a powerful MediaTek M8173C 2.10GHz with 4GB LPDDR3 memory to deliver high-end performance even during intense multitasking. The Acer CB5-312T-K1W1 Touchscreen 13.3" Chromebook also features a 32GB of flash storage to save your many documents, videos, music and other digital files. There are also built-in speakers and a microSD card reader. Acer CB5-312T-K1W1 Touchscreen 13.3" Chromebook is thin enough to take with you no matter the destination. Acer's agile 360° hinge gives you 4 usage modes, and the flexibility to work or play anywhere. A fanless design keeps your device silent and dust-free at home and at work. With an incredible battery life, stay out for the day and return home with time left to spare. 802.11ac technology supports several data streams in each direction for improved wireless performance.